Pen-and-ink and wash drawing by an Indian draftsman of the medallions carved on the pillars of the Durga Temple at Aihole, from an album of 31 folios of drawings of sculpture in the rock-cut caves and temples at Aihole and Badami, dated 1853. Aihole was one of the capitals and an important commercial centre of the Early Western Chalukya, a powerful dynasty which ruled the Deccan from the sixth century. Together with the two other capitals of Badami and Pattadakal, the site has preserved many Hindu and Jain temples which belong to a period that goes from the sixth to the 12th centuries, belonging to the Early and Late Chalukya periods and to the Rashtrakuta era. The Durga Temple is the largest and more elaborate of the temples at Aihole. It was erected at the end of the seventh century during the Early Chalukya period. It is built on an apsidal plan and is elevated on a high plinth. An open colonnade surrounds the temple which consists of a sanctuary with an ambulatory passageway, a columned mandapa or hall and a porch with balcony seating. A fragment of the curvilinear tower still stands over the sanctuary. The sculptures that adorned the temple are among the finest of the Early Chaluky period. 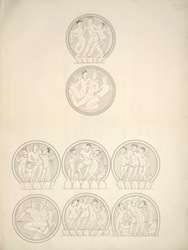 This drawing depicts the medallions containing amorous couples that are carved on the porch columns.